The Keene family operates the last dairy farm in Belfast. I met with Jeff Keene and his son Travis recently, on one of those frigid days when you want to be sitting around a wood stove. We met in their shop, which Travis said was the warmest building there. It felt warm to the Keenes, who had spent hours that day in a cold milking parlor and outside moving feed. Regardless of weather, their girls need to be fed and milked. I hadn’t been to this farm for years, not since the family took on a new venture — bottling raw milk and selling it directly under their own label. 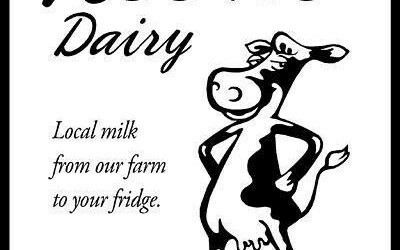 Keene Dairy now serves loyal customers at 13 local stores. The Keenes bottle and sell about 10 percent of the milk they produce. It’s a small, low-tech operation. Lyndsy Collins — sister to Travis’ wife — fills the bottles by hand. Later, she or another family member makes deliveries to local stores. The other 90 percent of the Keenes’ milk finds its way to consumers through a different route. The Keenes are members of DFA — Dairy Farmers of America — a large national cooperative that buys milk from 18,000 farmers and then re-sells it to various processors. Every other day, a stainless steel tank truck visits the farm, and the Keenes’ milk is blended with milk from several other Waldo County farms, before it is trucked off for processing somewhere in the Northeast. Eventually, it finds its way into supermarkets as pasteurized fluid milk, butter, ice cream or whatever. So the Keenes are selling raw milk to their neighbors, as most farms did a century ago; but they are also part of a large, modern corporation that buys and sells milk as a commodity. In this way, the Keenes are simultaneously involved in the two predominant forms of farming today. The first track captures farms that sell products as commodities to wholesalers or processors. This includes most of Maine’s dairy farms. The second track has been described in different ways over the years, but the term usually applied today is “local agriculture.” Farms following this track could be raising livestock or vegetables or any other product. What distinguishes them is not what they are growing, or even their size (though many smaller farms fall into this category), but rather, how they market. These farms are marketing “direct” (through a farm stand or farmers market or CSA) or “close to direct” (through a few stores or restaurants). The consumer knows where the products come from and often feels a connection to the farmer. The bulk of farming in Maine remains commodity agriculture, but much of the recent growth has been in local agriculture. The near future will likely continue along both tracks. At the same time, I suspect that an increasing number of farms will — like Keene Dairy — have a foot in each camp. Each form of farming presents challenges. The history of commodity agriculture shows that the primary economic benefit often flows to middlemen, not the farmer. At the same time, local agriculture often can’t meet the price or convenience that many consumers demand. Keene Dairy faces all this, plus other challenges. Its bottling operation has many loyal customers, but doesn’t bring in much money, in part because of its small scale. Yet if the Keenes wanted to expand, they would need to buy specialized equipment and take on far more risk. Meanwhile, with the milk they sell to DFA, the Keenes risk getting paid less than it costs them to make that milk — just like all dairy farms that sell milk as a commodity. The base price paid to a farmer for any milk sold to a marketing cooperative (like DFA) or a processor (like Oakhurst) is set by the federal government. In Maine, that base price can be adjusted upward — and it’s a good thing that it can, because the federal price is often well below the farmer’s cost of production. But even with Maine’s adjustments, farmers lose money whenever the federal price is too low — and that has now been the case for much of the past few years. The milk pricing system is extremely complicated and not well understood, even by many policymakers, let alone the public. I often hear that if Maine farmers can’t make money, either they don’t operate efficiently or Maine must not be a good place to make milk. But in truth, dairy farmers are struggling nationwide, while Maine is indeed a good place for dairy, because it is cool, relatively wet and close to major markets. The problem is not Maine, but a faulty federal pricing system. One reason I’m optimistic that federal dairy policy will ultimately change is that more and more people outside of agriculture are beginning to pay attention to what’s happening within our food system. With more consumers buying from local farms like Keene Dairy, society is re-learning how farms can be powerfully and positively interconnected to our communities. I asked the Keenes what message they’d like to communicate. Jeff talked about how fortunate the family is to have such local support — not just from customers who love their milk, but so many others who appreciate how they steward 340 acres of open space with such care. Travis agreed with his dad, but then made it more personal, saying how happy he was that he had a chance to be farming. What I didn’t say just then — but should have — is how happy I am that Travis is farming. When the editor of this newspaper asked if I’d write a regular column, I reflected on how I’d approach the task. I knew I’d want to write at times about farms, given my passion for farming, and I’d likely write a little about politics, given my deep interest in policy and my past legislative service. And of course, I’d want to write about community, which both drives me and grounds me. In writing about the Keenes, I got to do it all. John Piotti of Unity is executive director of Maine Farmland Trust and this newspaper’s newest columnist. “Cedar and Pearl” will appear every other week.